We are a non-profit, charity organization dedicated to providing quality care to the children of the Victoria Park CI school community and surrounding community members since 1986. Our centre is situated within the secondary school which provides us exclusive use of an amazing courtyard playground. We have space for 36 children (10 infants, 10 toddlers and 16 preschoolers) and a flexible facility that provides separation for the different age groups. Our educated and dedicated staff ease the transition to full time care for new children and work with the available school resources to provide a unique educational experience for all children. 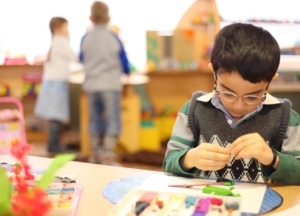 We aim to develop the whole child through an environment that fosters a positive self-image and a love for learning. A qualified and experienced staff provide programming that builds upon their curiosity and interests. Partnerships with families and the community help to expand the child’s experiences and world. We use the emergent curriculum that allows both the children and adults to guide the curriculum decisions. Lessons are formed as responses to children’s questions and interests. We also utilize the knowledge and concerns of the staff to create an evolving education. Our emergent curriculum fits with the Ontario government’s recommendations for early learning. Early Learning for Every Child Today: A Framework for Ontario Early Childhood Settings (known as the ELECT framework) describes how young children learn and develop. This document provides a guide for curriculum in Ontario’s early childhood settings, including child care centres, kindergarten, Ontario Early Years Centres and more services. We are proud to provide an emergent curriculum that follows the ELECT recommendations from our Ontario government. Through this framework, we at Victoria Park Child Care Centre are preparing our children for the demands of the Ontario Kindergarten program. Our staff include a combination of Registered Early Childhood Educators and Assistants who are eager to nurture and collaborate with each child. We are grateful that so many of our staff have been at the centre for many years and have built strong relationships with the families in our community. It is always a joy when our children come back to visit! Our staff take part in continual professional development programs and maintain a First Aid and CPR certificate. Complete Program Statement An in-depth plan for the future of the centre’s programs. ELECT Framework Ontario government’s early childhood education recommendations. Parent Handbook The handbook for every family new to our centre.